STP Silver Sound and Vibration Dampener reduces heat caused by engine, exhaust and sunlight. STP Silver is formulated specifically for automotive applications, but can be used in many home applications as well. 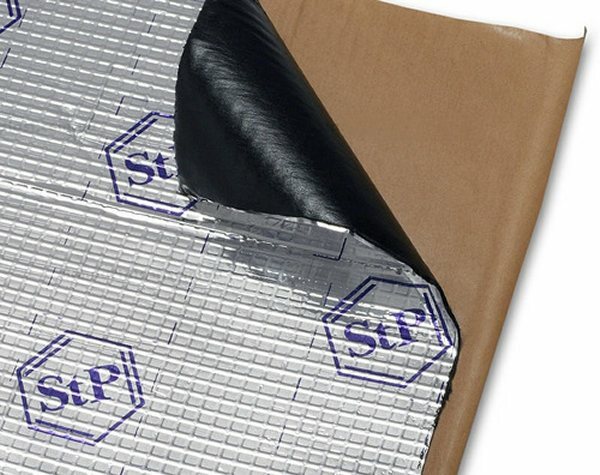 STP Silver Heat and Sound Dampener is made of flexible butyl rubber with an adhesive layer on one side, and a foil backing layer on the other. Apply STP Silver to doors, trunk, floor, roof, firewall and tunnel. This creates a thermal barrier reducing the heat transfer into your vehicle by over 40%. Your vehicle is surrounded by heat sources that penetrate into the interior. Everything inside your vehicle heats up, including your shoes. STP Silver reduces the thermal transfer at the source and makes it much easier to keep the interior comfortable for both short and long rides. STP Silver is thicker and outperforms the closest competitor. STP Silver is the easiest product to install - is flexible and can be easily molded to un-even surfaces. No preparation or solvent cleaning of the surface is required. Simply peel and stick. Apply STP Silver to every metal, plastic or fiberglass panel surrounding the vehicle interior creates a solid door, firewall, floor, tunnel, roof and trunk. You can read more about STP SIlver Here. Our STP Silver items have 6 ratings with an average score of 5 out of 5 stars.